Yesterdays Wall Street Journal had a very interesting article related to Dupont's impending election, noting the importance of small shareholders in the voting process. The vote will be to elect DuPont's 12 directors. Trian has nominated an alternative slate containing eight of DuPonts nominees and four of their own, including Trian boss Nelson Peltz. A decade or so ago, institutions typically sided with management. Today's institutions appear to take a more nuanced look at the issues and directors upon which they vote. Still, the typical shareholder is likely to be apathetic with regard to voting, assuming that their small holdings do not count. 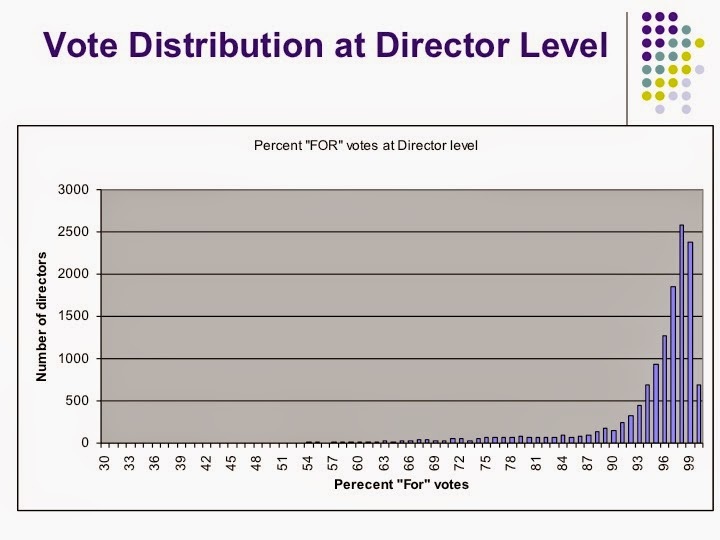 To understand the typical voting distribution, take a look at the chart below from our Journal of Finance paper, Electing Directors. The typical director gets well over 90% support. The chart is derived from an analysis of about 2500 director elections (for more detail, see Electing Directors). However, only four of those were contested. In the DuPont case, the 12 directors receiving the largest number of votes will be elected. It will be interesting to see how this one turns out and if Trian is successful, what changes in DuPont's structure and what changes in share value follow.